Zack Ruskin: Your newest book, At Home: A Short History of Private Life, takes the domestic home as its subject. Given the places you’ve traveled and the expansive nature of works like A Short History of Nearly Everything, what inspired you to write on your house? Bill Bryson: I was struck by how little I knew about the history of the objects that surround us in our daily lives and thought it might be interesting to look into all the things we take for granted — the things most immediately around us. Zack Ruskin: You’ve made a wonderful habit out of tracing the roots of things we pretty much take for granted. When did you first discover how engrossing the histories of refrigerators and chimneys could be? Bill Bryson: I have always taken the view that almost everything is fascinating if you just take the trouble to look at it with an open mind. Zack Ruskin: Of all the minutiae you put to the microscope in At Home, is there any one tidbit that you find most astonishing? Bill Bryson: What surprised me most was how long it took us, as beings, to get comfortable. You would think that comfort is something we would naturally strive for, but actually for most of history most people — even well off people — lived in conditions that were cold and damp and woefully ill-lit. As I say in the book, the history of private life is really a history of getting comfortable slowly. Zack Ruskin: Many readers know you primarily through your travel narratives. Do you see At Home as a travel narrative of sorts, in addition to its qualities as a history text? Bill Bryson: I suppose so, but in that sense all books are a journey of some sort, aren’t they? The main difference between this one and my travel books is that not once in At Home do I get drunk and make a fool of myself. Zack Ruskin: If you were living, say, a thousand years ago, what aspect of your home do you think you’d miss the most? For me, I’m pretty partial to indoor plumbing. Bill Bryson: For me it would be lighting. Something that everyone should do sometime is sit with a single candle in an otherwise completely dark and see how you would like to spend all your evenings like that. It would drive you crazy. Yet for much of history a single candle was all the light that most most households would have burning at any one time. Zack Ruskin: I want to thank you for your Bryson’s Dictionary for Writers and Editors. I keep in on my writing desk and consult it more often than I care to admit. What was your initial intention with that book? Were you seeing writers and editors make egregious mistakes, and wanting to straighten them out? 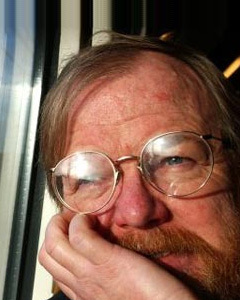 Bill Bryson: Thank you for those kind words. English is a tough language and, like most people, I am often uncertain about matters of usage and spelling. Is the word for a rough patch of skin callus or callous? What is the difference between imply and infer? Do I write gantlet or gauntlet, and does it matter? My idea was to provide a quick, concise guide to all the things (or at least all the ones I could think of) that commonly cause problems in English. Zack Ruskin: Many writers struggle to make the all-important first dent on the blank page or screen. As an immensely prolific writer, I’d love to know your approach for beginning a new book or article. Bill Bryson: It is the hardest thing in the world, and I can tell you it doesn’t get any easier. I don’t have any special trick, I’m afraid. It’s just a question of sitting down at a keyboard and making your fingers move. Zack Ruskin: I’m not sure why, but I have often thought about how amazing it would be to read a book by you set in Antarctica. Have you been there? Would you ever consider it? Bill Bryson: I would love to go to Antarctica. Unfortunately, I recently gave my wife a solemn vow that I would stop wandering off all the time and instead spend my twilight years following her around the garden with a wheelbarrow. So Antarctica is not a realistic proposition for me at least in the short term. Zack Ruskin: The element of humor is an integral part of your works. Do you ever feel obligated to be funny? How do you integrate humor into your prose? Bill Bryson: For me, humor is always really hard work, and using humor when you are making a serious point is the hardest of all, but I do think it can make a world of difference to the accessibility of text at times. Zack Ruskin: Before I let you go, I’d love it if you’d share with us a couple of your favorite word origins. Etymology is such an awesome subject area, especially in the archaic land of the English language. This interview appeared on the Book Passage blog on October 8, 2011.